IQS Directory provides a comprehensive list of quartz heating element manufacturers and suppliers. Use our website to review and source top quartz heating element manufacturers with roll over ads and detailed product descriptions. Find quartz heating element companies that can design, engineer, and manufacture quartz heating elements to your companies specifications. Then contact the quartz heating element companies through our quick and easy request for quote form. Website links, company profile, locations, phone, product videos and product information is provided for each company. Access customer reviews and keep up to date with product new articles. Whether you are looking for manufacturers of quartz tube heater elements, infrared quartz heating elements, conductive quartz heating elements or customized quartz heating elements of every type, this is the resource for you. TUTCO concentrates production efforts on resistance heating elements and custom-designed heating elements for OEM specifications to the air conditioning, heating and home appliance industries. Some of our elements are included in window air conditioners, clothes dryers and more. For the industry leader in heat systems and accessories, contact Thermal Devices. They have everything you need for your next electric heating elements order. They have an extensive product line at affordable prices. Purchase on-line by selecting products at the top or simply contact the company for assistance in locating or selecting a heater/electrical control product. Quartz heating elements are typically used in infrared heaters and provide a source of rapid heating. Quartz infrared heating elements run electrical currents through specially prepared resistors in order to convert electrical currents into infrared rays. These infrared rays vary in wavelength depending on the application and the distance.Quartz heating elements are most often used in industrial applications since they are able to provide faster process speeds. Quartz is an ideal heating element, working well as an electrical insulator because it is heat-resistant and passes heat with very little absorption. Typical industrial applications that utilize quartz heating elements include high speed production as well as processes such as drying paint, curing film, pre-heating, thermoforming and sealing various adhesives and powder coatings. Quartz heating elements are able to reach operating temperature in seconds, thus making them most cost efficient for systems that require long heating off cycles. In addition, quartz heating elements can be easily used in industries requiring zone control such as electronics, automotive, printing, petrochemicals, glass and textiles. 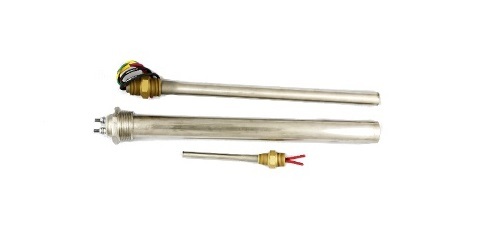 There are two main types of quartz heating elements: quartz tube elements and quartz lamp elements. A typical construction of a quartz tube element consists of a wound resistance coil that is run through a series of parallel quartz tubes that have all been encased in a highly reflective body, often made from aluminized steel. Most effective in radiant applications, quartz tube heating elements are often used for the processing of heat-sensitive materials. Quartz lamp elements consist of a housing, typically aluminum, with a polished reflector. In infrared heaters, quartz lamp elements often produce useful infrared radiation in wavelengths shorter than five micrometers. An enclosed filament, such as tungsten, can operate at around 2,500° K and produce more short wavelength radiation than can other open wire-coil sources. Quartz lamp elements are often used in high speed production processes and provide extremely high watt density. An advantage that quartz heating elements have over all other types of heating elements is their ability to turn on and off instantly. This ability can make industrial heating processes safer. Quartz Heating Elements - Hotwatt, Inc.